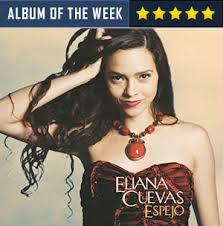 This is the fourth recording from Venezuelan-born and Toronto-based vocalist, Eliana Cuevas, which is both seductive and tender. Her interviews suggest that she likes to push limits of Latin music; she changes moods from the bouncy first track, “Estrellita” to the sultry, slow ‘Lamento’, to the sensual “En Un Pedacito De Tu Corazon”, to the jazzy swing of “Agua Cangrejo Y Sal”. The album features an array of 20 musicians from Latin/South America and Canada, and mixtures of instruments, such as the mandolin and the melodic. Voice-overs add melodic seduction. This is a fun album with all sorts of rhythms and textures. It does mirror the range of possibilities for creative talk, which she offers quite skilfully. The album was released last August by Alma Records, and in June, won the U.S. Best Latin Album at the Independent Music Awards.